"Four Students Sitting on Hersey Hall Rail, Westbrook College, Class of"
Westbrook College students Alison Mott, Lisa Martin,Wendy Kemp and Karen French, Class of 1980, were Fashion Merchandising majors and lived in Proctor Hall. 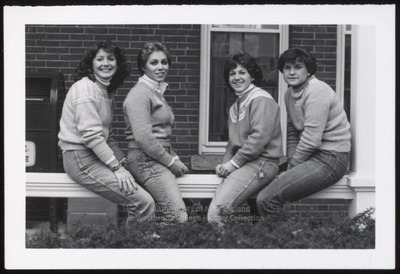 For their senior class candid photo, which appeared in the 1980 Tower Yearbook, they wore jeans with pale, Fair Isle sweaters and white turtle necks or collars. Except for Alison, they wore their hair ear length, parted on the side, and feathered back. They sit facing each other, straddling a railing, on the Hersey Hall front porch.